It is necessary to attraverse the courtyard of the archbishop's palace in order to visit the church of St. Eufemia, whose apsis area, which is decorated with small hanging arches and pilaster strips, looks out on the stairway which leads to the Cathedral. 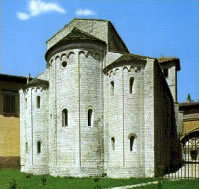 This interesting Romanic building of the 12th century hides under a simple and at the same time austere facade dating back to the 12th century and decorated with only a single mullioned window an interior with three naves divided by columms and pilasters of various styles, and illuminated by windows with one light of the Romanic lombard style. The roof with two slopes raised up higher at the center is typical of the first Spoletian Romanic architecture, with concentric wrapped-up portals and small rampant arches. The detail which is perhaps of major artistic interest is the women's gallery because this architectural tipology is to be found only very rarely in the region of Umbria.